Un aperçu complet d'Austin lors d'une excursion de 2 heures en bus. Découvrez de célèbres monuments ainsi que des joyaux cachés, de véritables quartiers, et les fameux food trucks. Choisissez un départ le matin ou l'après-midi en fonction de votre programme. Obtenez un bref exposé de votre guide sur les arrêts brèves au Texas State Capitol et dans d’autres lieux intéressants. Retrouvez votre guide à l'Austin Visitor Centre et montez à bord de votre bus pour commencer votre visite. Pendant que vous vous arrêtez-quelques minutes à chaque destination, écoutez les commentaires instructifs de votre guide sur l'histoire et des particularités du lieu. Les arrêts comprennent une variété de sites, tels que l'intérieur du Texas State Capitol Building et le graffiti park. Laissez-vous tenter par une petite douceur aux food trucks et prenez une photo devant la carte portale d'Austin. Vous en apprendrez plus sur l'art, la musique, la culture, la cuisine, l'histoire, des parcs, les résidents célèbres et sur la devise « Keep Austin Weird » de la population locale. Very nice, enjoyable tour. Our tour guide, Matt, was wonderful. Very informative and excellent sense of humor. What a great tour guide and funny also! A very good tour I would recommend to others! Great introduction to the city and guide Ike was excellent, knowledgeable and funny. Sorry no photos, I'm not that tech savvy.... But this tour was excellent! Steven was very knowledgeable especially about the Capital bldg and entertaining. Fascinating and enjoyable tour. Highly recommend it!!! Overall great and interesting tour. I would have liked to been able to get down at the graffiti mural to take pictures instead of just zooming by. Our tour guide was awesome! Very knowledgable, kind and FUNNY! I forgot his name but I have a picture with him which I will share. On my recent 16-day, five city tour of Texas, including Houston, Galveston, Waco, Austin, and San Antonio, I booked three city tours: Waco, Austin, and San Antonio. Of the three, I have to say that the Austin Detour tour was the weakest. Our tour guide did ok but unlike the other two where I felt both passion and an expertise from the guides that we had, I simply did not feel that with our Austin guide. Austin, on the other hand, was our favorite city. Steven was our tour guide and he's also a stand up comedian in the evenings! He had great stories and funny commentaries on all the key sights during our two hour Austin tour. As an Austin native he has all the local history down cold. Very knowledgeable regarding the history of the city of Austin. Would highly recommend his tour to anyone! Thank you, Steven! Great 2 hour tour of the basics. Steven did a great job taking us around and showing us the sites. We had a wonderful time. Justin, our tour guide, was charming and informative. 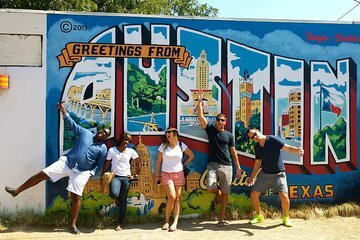 We were only in Austin for a short time and this tour gave us a wonderful feel for the city as well as a bit of an insider view!